Altered Instinct: Meet the author: Brhi Stokes, author of urban fantasy Caligation. 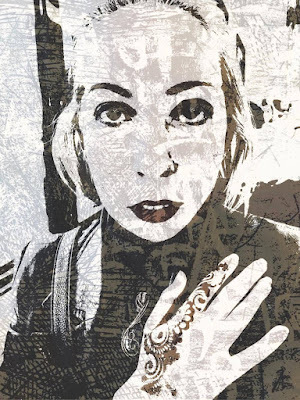 Meet the author: Brhi Stokes, author of urban fantasy Caligation. 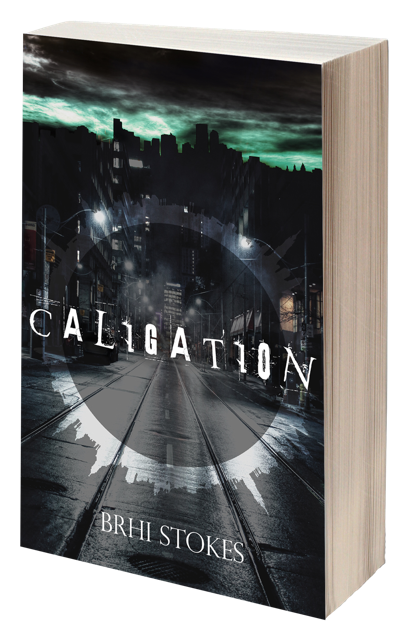 A couple of weeks ago, author Brhi Stokes was kind enough to give us a sneak preview of her book Caligation as it headed for publication. She returns today for a chat about the book, her writing and more. Hi, Brhi, and conratulations on the publication of Caligation! Glad to have you on the blog, and for our first question, let’s talk about that title. Where does the title Caligation come from? Caligation is a real world. It comes from the latin Caligo, meaning dimness or cloudiness. In the book, Caligation has some interesting attributes to do with fog. It also reminded me of a lot of American towns with -ion names and lended to the feel I wanted. Tell us a little more about the book – what’s it about? Caligation is about a young man who starts hitchhiking north to see if life won’t throw him something more interesting. Unfortunately for him, it does. After a brutal car accident, he awakens in a city beyond his wildest nightmares. The book follows his journey as he is chased by horrific beasts, and becomes embroiled in the mob doings in the city. All the while, trying to discover where he is and if he can even get home. Is this your first book? How have you found the build-up to publication? It’s been fun. I’ve done almost everything (save for some of the editing) myself. The cover design and layout and formatting were all me and I thoroughly enjoyed it. I love planning and organising, and I’ve had a lot of great support from fellow authors as well as family and friends. I do like the cover for the book – how did you go about the design process with that? Originally, I had a different cover but I knew I could do better and I began to browse similar styles of work until I was able to craft together the idea. I wanted a sort of inverse of a city, I knew that much. Eventually, I found an image which suited Caligation - the dark street, the tram tracks, the wetness of the ground - and added in the symbol I’d designed for the city for symbolism and a bit of colour. I’d had the silhouette and menacing clouds in the previous cover design and wanted to keep it. So I changed the colour to the sickly green it has now and spent some time figuring out placement of the elements. Basically, I wanted a modern city, but I also wanted it to be clear that there was something wrong, that this wasn’t ordinary. Caligation is urban fantasy – who are the writers in that field that you love reading? I absolutely love Neil Gaiman and Sergei Lyukanenko. Both do modern but fantastical really well, and have quite dark elements to their work. I’m not a huge fan of the usual urban fantasy (which has sort of been taken over by the paranormal romance genre) of “main character is cool supernatural creature who does cool supernatural creature thing”. I don’t mind the main character knowing about the world they’re in and being experienced in it, but I really enjoyed an MC who had literally no idea what he was in for. Okay, wish fulfilment time – Caligation gets picked up to be a TV series or movie. Who are the actors you would cast in the lead roles? What is it about those actors that matches up to your characters? This is hard for me and only partially because I’m terrible with actors’ names. I don’t really describe Ripley very much (he’s a male with long brown hair) for the purpose of allowing the reader to picture him however they like. He could easily be caucasian, dark-skinned or Asian (and often flits from one to the other in my head when I try to picture him, to be honest). The others I have pictured fairly well. I feel like Kristen Stewart would be good as Zero (though I’ve always pictured Keira Knightley for her, maybe it’s the name) but I find the strong jaw and almost ‘handsome’ features of both those women to suit. Probably Matthew Mcconaughey for Archer (he does grizzled super well and he’s the right age) and maybe Taylor Kitsch for Ajax because the Gambit style he had in Wolverine: Origins really suits Ajax. Whereabouts in the world are you based? And what are the advantages and disadvantages of being based there? I’m in Australia. There’s a lot less book-based cons here and a lot smaller cons in general so that sort of exposure is something that’s harder to come by here. It’s also horrible for Amazon shipping costs. But a lot of distributors are starting to base themselves here, so that’s pretty cool. Is there a moment in Caligation that you’re particularly proud of – without spoilers – a moment which goes beyond the overall plot to be something that you find particularly close to heart? I like the last chapter a lot. Without spoilers, the end of most of the chapter flicks between two different scenes and I feel like I’ve executed the tension quite well. I’ve also received a lot of compliments on that particular part. I love any bits in books that give me the rush of “what’s about to happen” and keep me on the edge of my seat, and that was the goal for that part. What next after Caligation? What’s in your writer’s cooking pot? Okay, so I have two projects available to me at the moment and I am having the hardest time deciding. I accidentally'd my way 30,000 words through a YA fantasy, which I could continue working on. Alternately, I have a sort of soul-sequel (similar premise, I suppose) to Caligation, which would also be gritty urban fantasy featuring a genderless MC and told in first person, sort of noir-style. One of those (ideally both) will eventually exist. I'm just not sure which one will come first. Okay, we traditionally have two closing questions around here – what are you reading at present and what is the best book you have read in the past year? I am being nagged by my husband to read The Accidental Sorcerer, which I will try to do as soon as I can (I have a few other indie authors to read as well). Best book in the past year would probably be the 3rd book in the Penny White series by Chrys Cymri - Penny White and the Marriage of Gryphons. The whole series is really well polished and just generally wonderfully enjoyable. Many thanks for stopping by, Brhi, and good luck with Caligation!